After analyzing the data collected from his misadventure with Talia in issue 13, Batman infiltrates Ra’s al Ghul’s organization. He takes the place of one of Ra’s men, and soon learns Ra’s plan, whatever it may be, has been delayed seven days. Later, Ra’s berates an American operative for not being aware of a Bedouin festival, which is the source of the delay. Ra’s follows the operative back to Africa, meeting a skilled Bedouin swordsman in his employ. Meanwhile, back in the jungle lair, Batman’s cover is blown. Ra’s speaks to Batman via satellite, explaining the jungle operation was a diversion, while his bombs were planted in the Antarctic. Once the plan is revealed, the captive Batman is revealed to be Robin in disguise! The swordsman steps forwards and threatens Ra’s; the swordsman is Batman! (He connected the delay with a Bedouin festival and left the jungle for Africa, leaving Robin in his place.) Batman and Robin fight their respective adversaries, while Ra’s American operative attempts to detonate the bombs. Inexplicably, the console housing the signal devices explodes instead. (Perhaps Robin sabotaged it?) 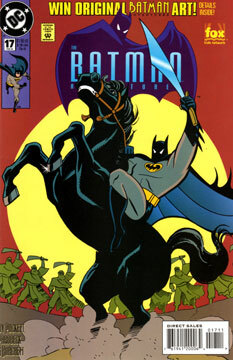 Robin escapes his captors, and Ra’s escapes Batman. Another unsung classic book. The pacing was tight, throwing the reader right into the action, and doesn’t get bogged down in details. The story could have easily become convoluted, what with the multiple diversions, disguises, and continents. But Puckett’s aim stays true straight through to the end. I wish modern comics were this clean in their scripts. More Parobeck art to drool over. Look at the first panel of page two. You can almost feel the impact of Batman slamming into that trooper. The Native American character is interesting, but we don’t see much beyond his head. Someone needs to make a (cast-able) army of League of Shadows soldiers. Hmmmm…. Ra’s has a few costume changes, including a “daring” orange number (really not his color).